There is nothing worse than the feeling of your car breaking down on the side of the roadway or freeway. Feelings of helplessness often begin to set in and it is difficult to not feel angry and frustrated at the situation. However, you do not need to feel like all is lost, Magic Valley Towing, a towing company serving the Jerome area, can be there to assist you in a matter of minutes. All you need to do is give us a quick call and we’ll take care of the rest! There is a common misconception that you will have to wait hours for a tow company to come and rescue you and your family. With Magic Valley Towing’s Jerome Towing Service you won’t have to wait long. We are committed to get to you as quickly as possible, most time in under an hours time, because we understand how dangerous it can be just waiting on the side of the road. In our effort to pick you up as fast as we can, we don’t forget about the safety of you, your family and that of your vehicle. For most, their car is an integral part of their lives and it is something that is extremely important to them. That is why we also focus on keeping your car safe and avoiding any damages to your vehicle as we tow it. We are a AAA certified towing business and provider. Meaning if you have roadside insurance through AAA, your tow will most likely not cost you a dime! We also accept many other forms of insurance and we strive to keep our costs low so that you can receive the assistance you need without breaking the bank. AAA also holds its providers to higher standards, so we do everything we can to ensure that your experience is a pleasant and even an enjoyable one. 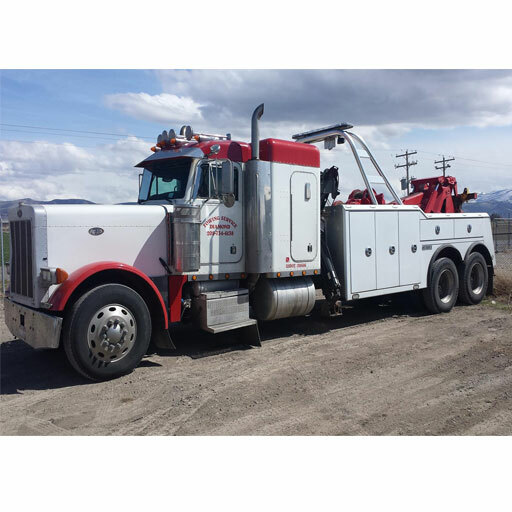 When your find yourself in trouble with a heavy wrecker accident in Jerome, you will want to know there is someone that can help you clean up any damage or haul your big rig to safety. Whether you were in a vehicle collision, weather-related accident, or any type of breakdown, our towing service close to Jerome is here for you. We have large trucks that can haul your semi off the road and competent drivers that will help ensure the roads are cleared and safe for driving. We also have a courteous staff that will work with you and meet any of your needs, including any paperwork that needs to be signed and gathering required insurance information. We go above and beyond for our customers so that you don’t have to feel the stress of having your car break down. Need a lift to a nearby hotel? We can do that for you! No need to call a cab or walk the distance from our tow yard to the hotel. If there is anything that we can do within reason to help you, we will get it done for you! Why Not Make the Call Now and Get You and Your Family Off the Side of the Road?